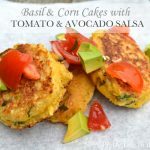 These Basil & Corn Cakes with Tomato Avocado Salsa are the perfect summer appetizer! They’re easy to make and are SO delicious! Make the salsa first so it has time to rest to let the flavours combine. Let rest for about an hour to let the flavours combine. You can make these ahead of time and keep them warm in your oven before serving time. So preheat your oven to 200 degrees. In a food processor pulse 2 cups of the corn (keep the other 1/2 cup aside), until it is slightly pureed but still chunky. When done, put the pureed corn into a bowl with the 1/2 cup whole corn kernels and mix. In another bowl, whisk together the eggs, buttermilk and melted butter. Mix in the corn, onion and basil. In a separate bowl whisk together the flour, cornmeal, baking powder, baking soda, salt and pepper. Then add the wet mix to the flour mix, and stir until just combined. In a frying pan over medium-high heat, add some canola oil for frying – just enough to cover the bottom of the pan – you don’t need much. Add the batter 1 heaping tbsp at a time, and cook each side 1-2 minutes, until they are golden brown. It is best to not crowd the pan, so only make 4-5 at a time. When they are done, transfer them to the oven to keep warm.